The most obvious contributor to comfort is air temperature. People have a narrow range of temperatures for comfort. Everyone’s a little different, but most people like temps between the high 60s to the mid 70s. The degree of activity makes a difference, as does the wardrobe. The amount of humidity that creates a comfortable indoor environment depends on the temperature. As a general rule, humidity levels between 30 and 50 percent indoors are healthy, although drier air feels better as temperatures increase. Humidity makes a difference because it affects how fast the moisture on your skin dries. The human body perspires to cool itself off and when the humidity is low, cooling is rapid. Increases in the humidity slow evaporation, which makes people feel warmer. 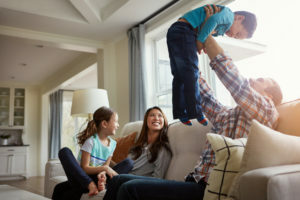 Although it doesn’t have an immediate, tactile affect on the body like temperature does, indoor air quality makes a difference in home comfort. People with allergies or asthma often suffer the most when the air has high levels of offending particles. Odors can be more than annoying, especially when they come from volatile organic compounds (VOCs). VOCs are gases that come from products made from petroleum. Opening doors and windows when the temperatures are comfortable will help improve your air quality. Your HVAC system improves comfort in the summer by cooling your home and the thermostat plays a big role. It tells the system when to turn on and off. A programmable thermostat will manage temperatures based on occupancy factors and help you save money. Manage home comfort during the summer by keeping the temperature and humidity within healthy ranges and the air quality high. If you’d like more information, contact Hartman Bros. Heating & Air Conditioning, providing HVAC services for Fort Wayne area homeowners.